Even more amazing is the power. A hot little 2.0-liter turbocharged I4 is under its long lean hood. Oh, and it’s also supercharged. That pumps the power to 316 horses with a torque rating of 295 ft.-lbs. The car leaps to life in Comfort driving mode and yet (wait for it) there is a Dynamic mode that turns the S90 decidedly racy. The lower gears are held longer, and there are plenty of those with an 8-speed Geartronic automatic standard on all models. Unlike many cars and trucks with turbo or even naturally aspirated power, there’s little bog here. Power is nearly instantaneous. Drive mode also gives you an Eco setting for saving gas and cutting acceleration. If gas prices head north bigtime that may be a helpful setting. For now, leave it in Comfort or Dynamic. Handling is fast and responsive, boosted as you might expect, in Dynamic mode. Comfort is fine for daily driving, but if you find some particularly fascinating back roads, well, the firmness of the wheel in Dynamic mode will be welcome. Braking is excellent at all times. 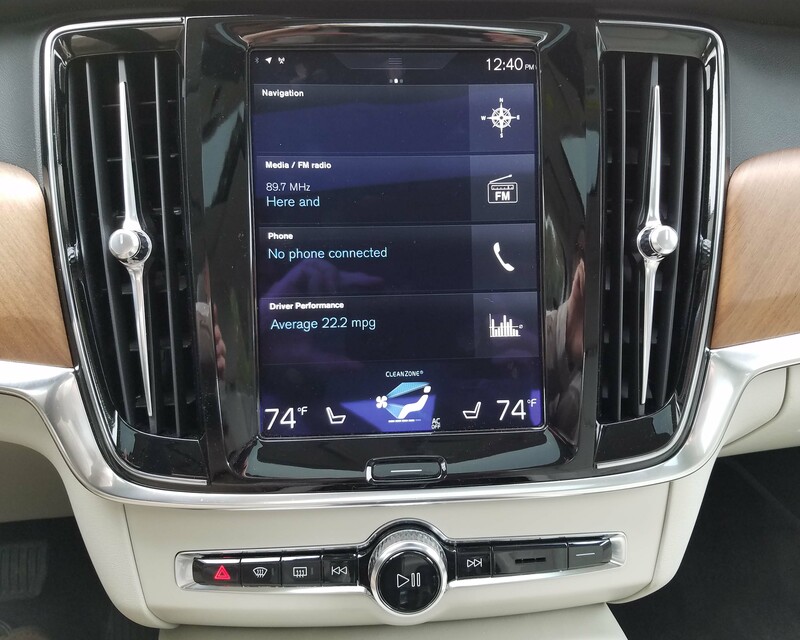 As for electronic semi-autonomous driving aids, well, Volvo loads up the S90. 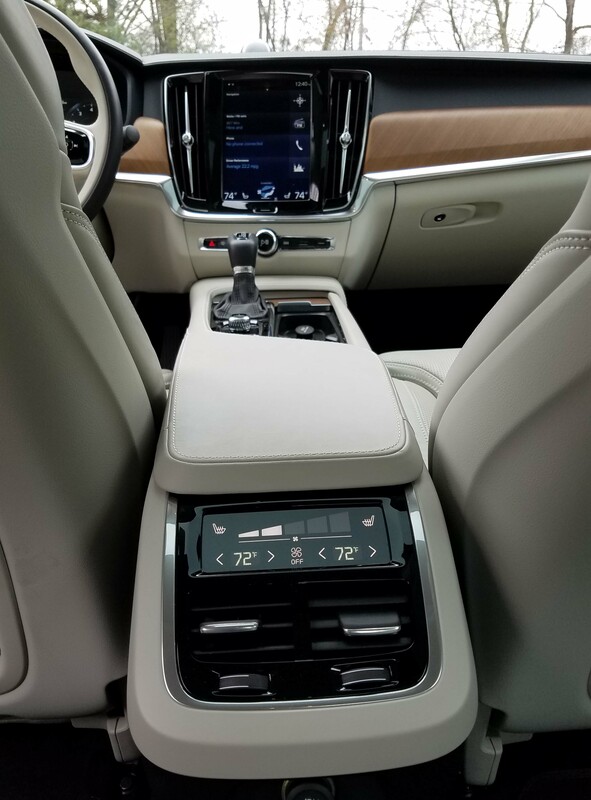 They include Volvo’s Gen2 Pilot Assist system that will keep your car in a lane at any speed so long as you keep your hands on the steering wheel. It senses your touch and will gently guide you to keep the car centered in its lane. But there’s also a run-off the road mitigation system that both brakes and steers the car to keep it from plowing into a ditch or careening into a tree when you’re driving between 40 and 85 mph. Stats show that drivers dozing and doing just causes many accidents. Note these are both in addition to a lane departure system that warns you if you’re approaching the center line or road’s edge. I find such systems annoying, but you can turn this off. On a highway drive the other systems could be life savers though. 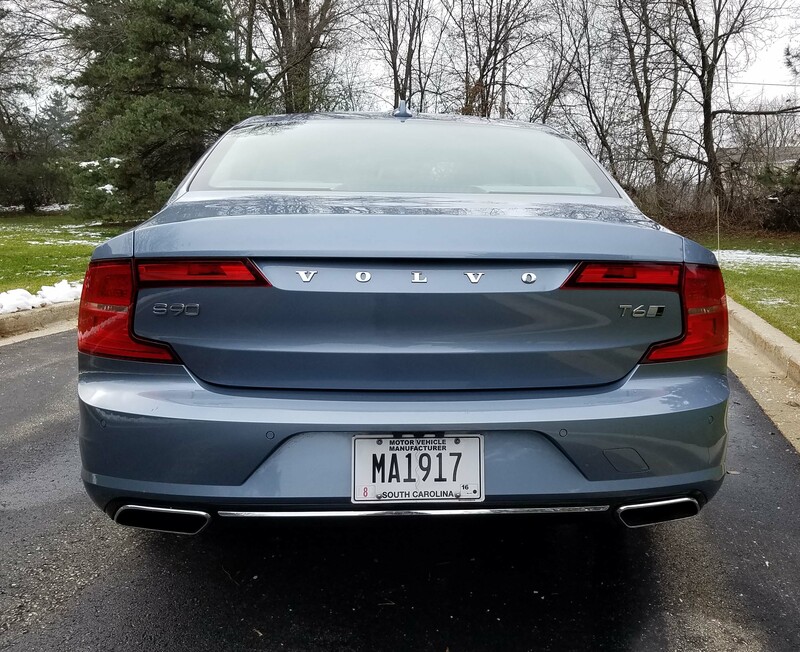 Volvo also includes its noted City Safety collision avoidance system that brakes automatically to help you avoid rear-end collisions when the car in front of you stops unexpectedly. There’s also a pedestrian and cyclist detection system tied in to the Volvo. 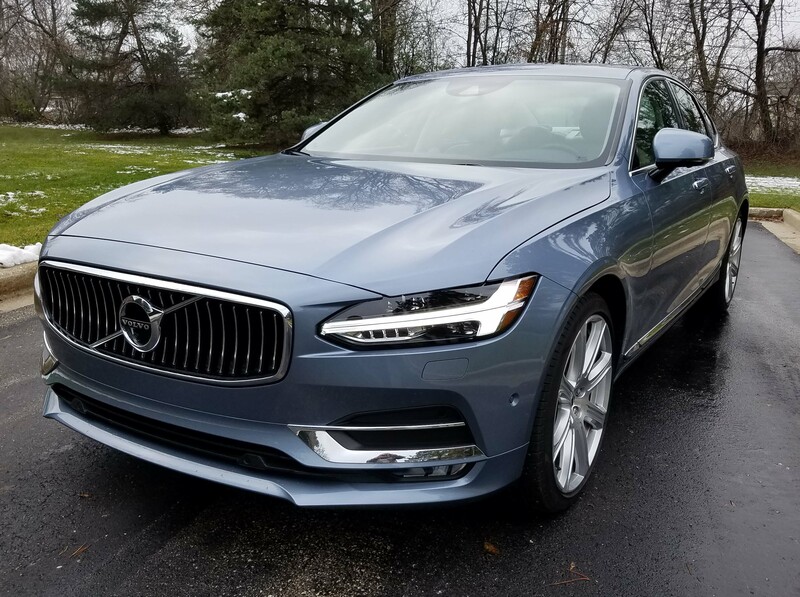 Ironically, the blind-spot warning and cross-traffic alert systems, which many lower-cost vehicles now feature, is not standard, but part of the $1,950 Vision package. That also includes a 360-degree surround view camera that is a parking aid, plus auto-dimming inside and outside mirrors and the exterior mirrors will power flat against the car when it’s parked and turned off. The Inscription model, the top-level T6, also is equipped with all-wheel-drive, a plus in our northern clime. We had at least 6 inches of snow during my test drive and while the AWD helped, it did not seem to aid grip as much as in my Subaru Outback or in previous Audis I’ve tested. Still, I’d rather have it than not. 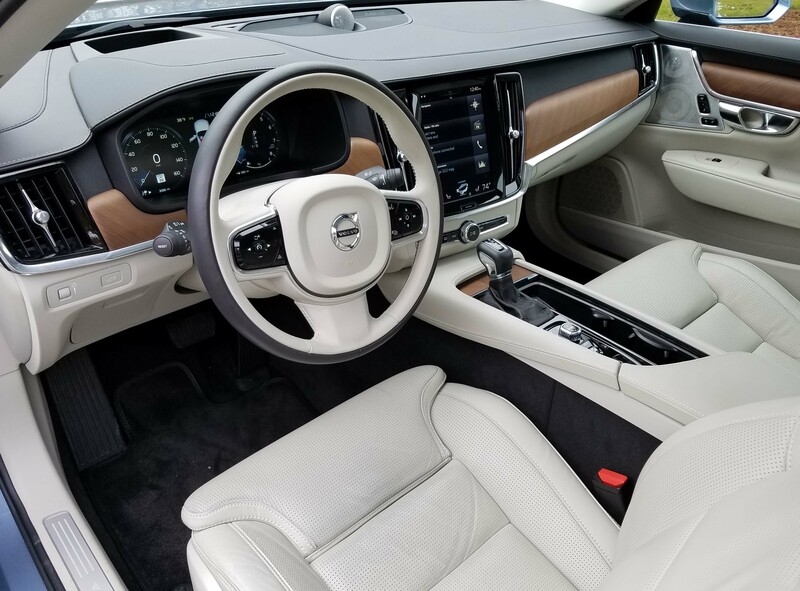 While the S90 looks long and lean outside, the interior is equally elegant and reflective of its Swedish origins. Despite being owned by a Chinese company, Volvos are still made in Gothenburg, Sweden. The icy metallic-blue test car had a dark brown leather dash top with real open-poor walnut facing, door and console trim. The rest of the dash was tan like the perforated leather seats and a satin chrome trim accented doors, air vents, the shifter and steering wheel. Beautiful, and extremely quiet inside the S90! Amid the center stack is an iPad-sized rectangular screen for adjusting the radio and other systems. It takes a little getting used to but works like modern touchscreens where you slide screens by moving your finger right to left on its face. That was easy enough to figure out, but less simple to use while driving. My biggest bugaboo, as always, is that there were no preset buttons easy to get at for tuning the radio. To switch channels I was constantly scrolling the screen up and looking for the next one. Oh, and sometimes you switched stations just trying to scroll the screen. Otherwise the dash and controls were easy to see and use. The seats are heated and cooled up front and heated in back. Plus the steering wheel featured three levels of heat, the warmest of which was so hot as to rarely be needed. The S90’s screen is about the size of an iPad and works similarly. Note that the S90 has a manual tilt/telescope steering wheel. Many luxury sedans in this price range offer power-adjusting steering wheels. The Volvo seats are wonderfully shaped to give side and back support. I’d like one of these for my living room! Plus they are powered and feature two memory settings so you and your significant other can pre-set your favored seat and mirror positions. However, I could never get the memory feature to remember my lumbar setting. It always reverted to at least half inflated, which was too much pressure for my lower back. Also, while the driver’s seat heat and steering wheel settings were remembered when the car was turned off and back on, the passenger’s seat needs to be adjusted each time on the big iPad-like screen. That seems inconsistent and torques off some passengers who wonder why there seat is not heating as the driver oohs and aahs about his toasty tookus. Overhead is a sunroof that helps lighten the interior on dreary winter days (if there’s no snow on the roof), and the test car added a wonderful Bowers & Wilkins stereo system that absolutely rocked the car. It costs $2,650, so could rock your wallet too. Plenty of controls for the back seat too, including heated seats. With gas still at modest prices we may not care so much about mpg. This one tops its class and is rated 22 mpg city and 31 mpg highway by the EPA. I got only 18.5 mpg in a mix, but heavier on city driving, but the weather was cold, and snowy. The Volvo prefers premium unleaded. 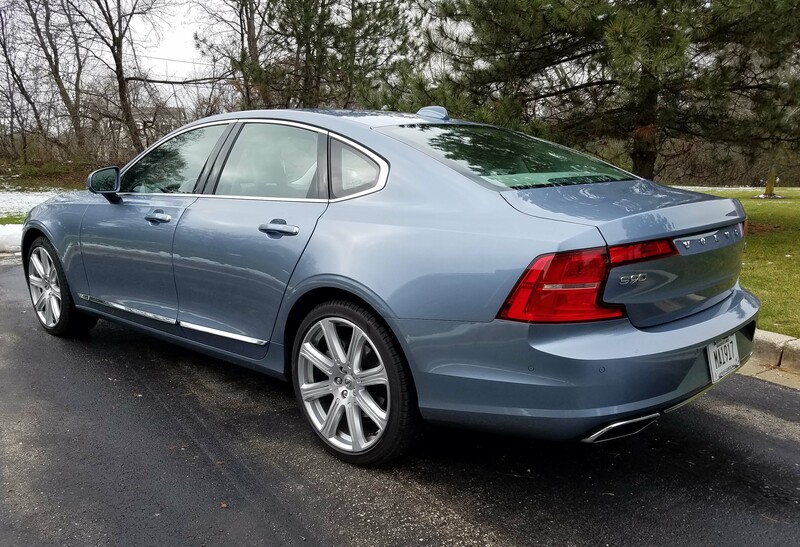 Pricing may surprise you, as there are just two S90 models, each in two trim levels. The T5 is the entry-level model with a strong 2.0-liter turbocharged I4 that makes 250 horsepower and 258 ft.-lbs. of torque. That model gets 23 mpg city and 34 mpg highway. The T5 front-drive Momentum model starts at $47,945 and the Inscription at $51,445. The tested T6 with AWD starts at $53,945 for the Momentum model and $56,250 for the Inscription, plus $995 delivery. The test car with various packages hit $66,105. Still, competitive with the BMW 5 Series, Mercedes E Class, Audi A6, Cadillac CTS and Jaguar XF and XE. But obviously this remains a better buy at lower levels. 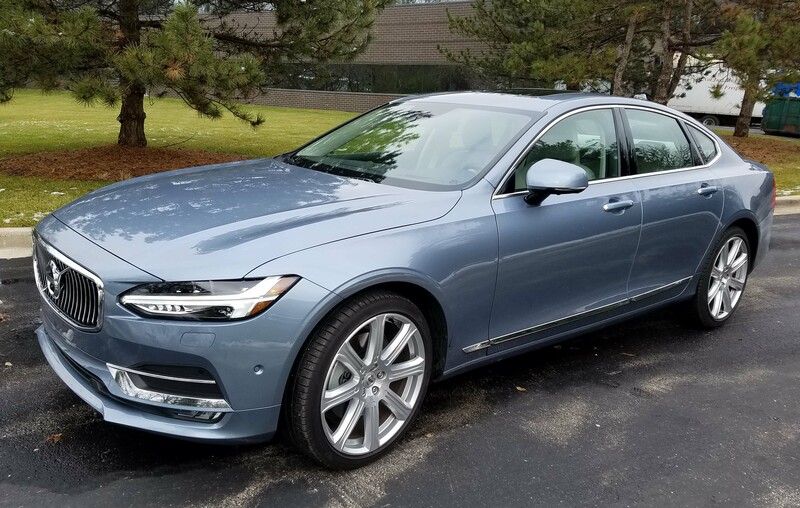 If you want a stylish luxury sport sedan that stands out, but still performs near the top of its field, Volvo’s S90 is your car. Hits: Superb power, handling and ride. Elegant looks inside and out, plus extremely quiet interior. 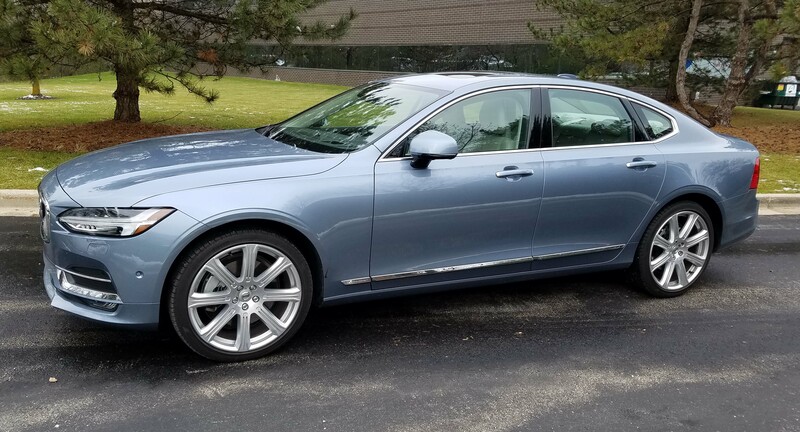 Luxurious feel and look inside with heated/cooled front seats, heated rear seats, heated steering wheel, sunroof, big iPad-like screen, adjustable drive mode, extremely comfortable seats, big-time stereo, plus full complement of electronic safety systems. Misses: Just a manual tilt/telescope steering wheel, must scroll on screen to find radio stations, modestly helpful AWD, passenger seat heat adjustment has no memory. Previous Post2017 Nissan Rogue SL AWD HEVNext PostYou want to race what against me?